After almost two months of laying low due to some leg injury issues, I am healed enough to get back to the construction of the railroad. Hopefully Monday we will be back on track (no pun intended). 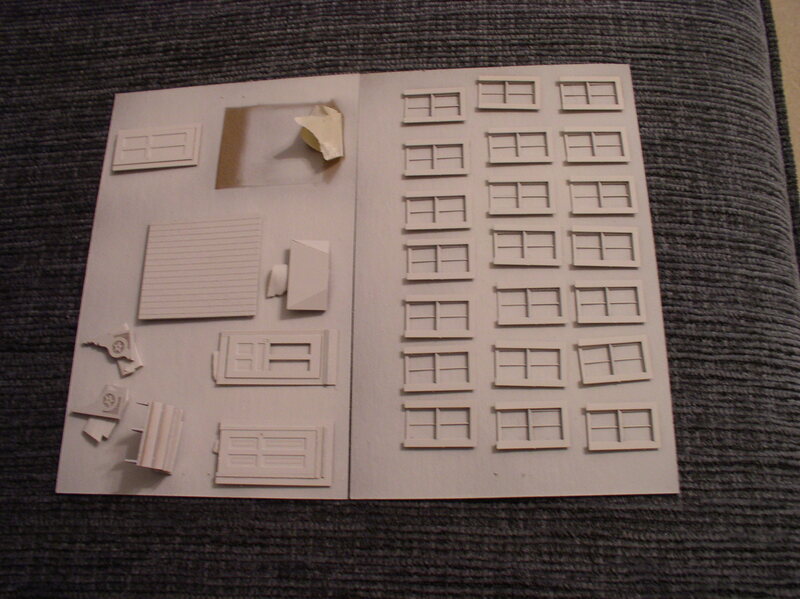 Not all has been lost however as there is always a host of projects to address in the model shop. This month has yielded several accomplishments. The Scott truck fleet is developing. Scott Trucking was responsible to move product to and from the rail yard to the various industries off line. The primary type used was the flatbed style which was very handy and versatile for the differing products. I have finished the first of several needed. The correct lettering down to the original phone number was supplied by a friend in Quebec. Bart Scott was quite the entrepreneur who also added a heating oil/kerosene business along with a service station and appliance store. I won’t have room for the service station and appliance store, but we can accommodate the oil storage tanks and pump platform that were a familiar scene at the end of the yard for many years. In fact I discovered that the tanks have survived unto this day, but now lay horizontal and are own by the Dead River Company in a different part of town. The lettering is yet to be applied and details added, but here they are. The add-on rolling stock project of three different reefers is also nearing its end. The lettering has been added and weathering of the cars is next. 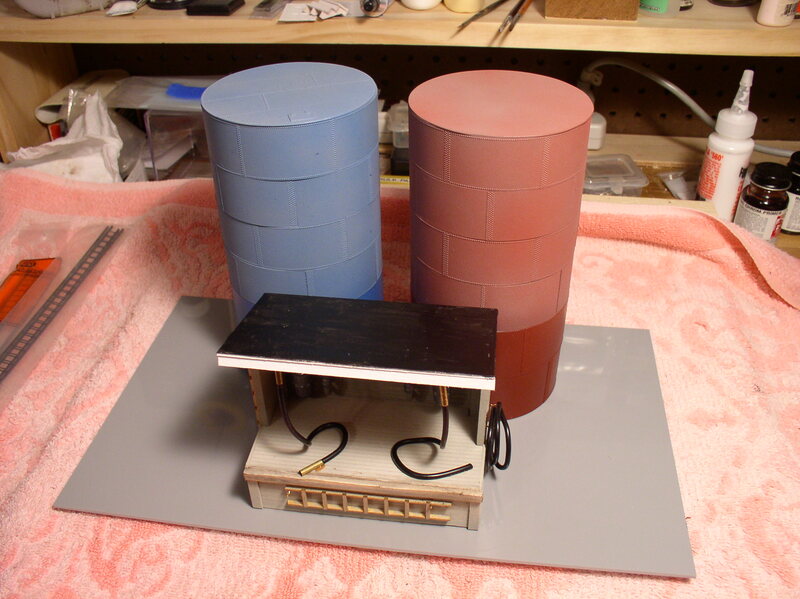 The Armour and the mechanical reefer are scratch built, the former from basswood, and the latter from styrene. The CN 8 hatch is a highly modified Intermountain steel reefer kit. 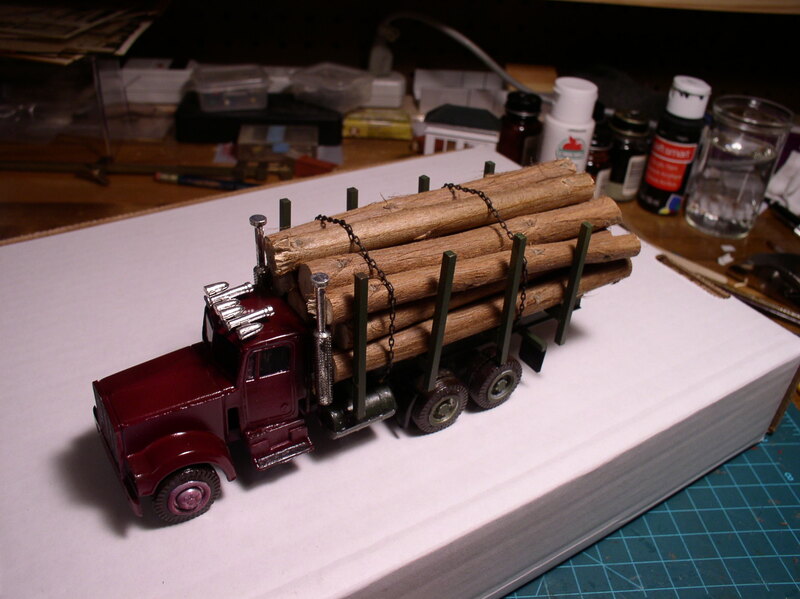 I have to add weathering and proper trucks to complete them. One of the biggest challenges currently is obtaining the proper lettering. 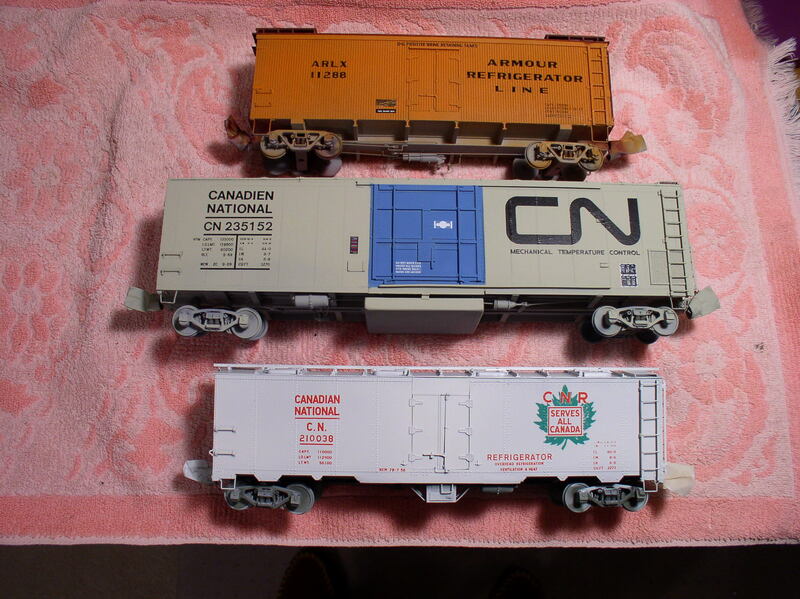 The Armour is a decal set from Protocraft and the CN cars used CDS dry transfers. My personal preference is the dry transfers, but the source of supply and the age of the existing product is getting to be problematic. Hopefully the next time I write will be a report on the railroad itself. While going over a photo that I have of Calais Yard looking south, I made note of three details that I feel are important. Of course once something like that is noticed, it becomes important. 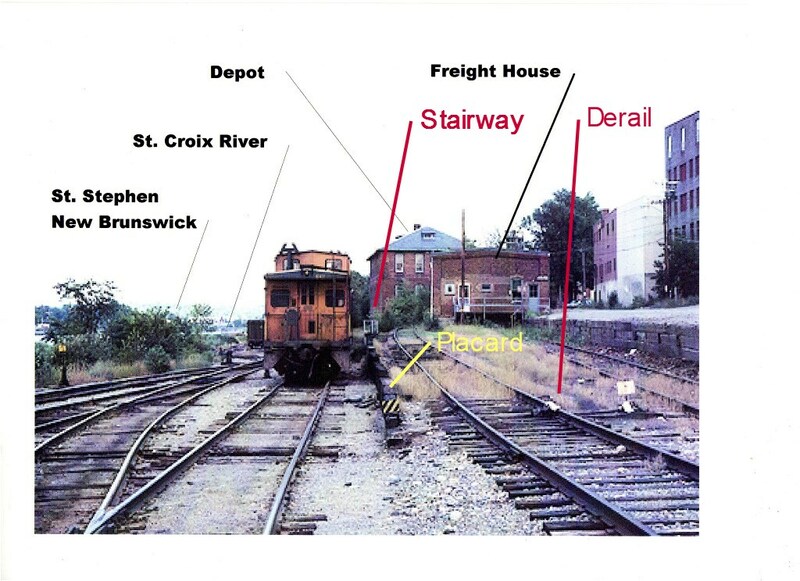 As you study the photo note that the track the caboose is on leads to the depot platform. The track to the right is the freight house track. It rises until it is above the depot track by about 5 feet adjacent to the freight house platform. There is a narrow stairway that was added for the convenience and safety of the workers. It is narrow but sufficient. 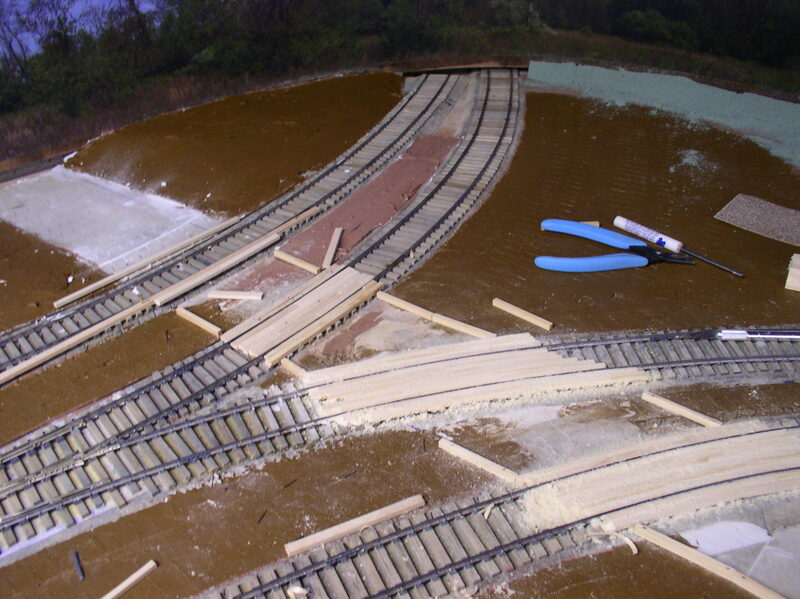 The two tracks are also separated by a railroad tie wall. This wall is also close to a worker riding the steps of a car on the depot track. Therefore a black and yellow placard has been added to the end of the wall as a close clearance warning. Because the freight house track is steep a derail has been added to keep a runaway car from reaching the yard throat. The discussed details are highlighted in color and will be added when the time is appropriate. 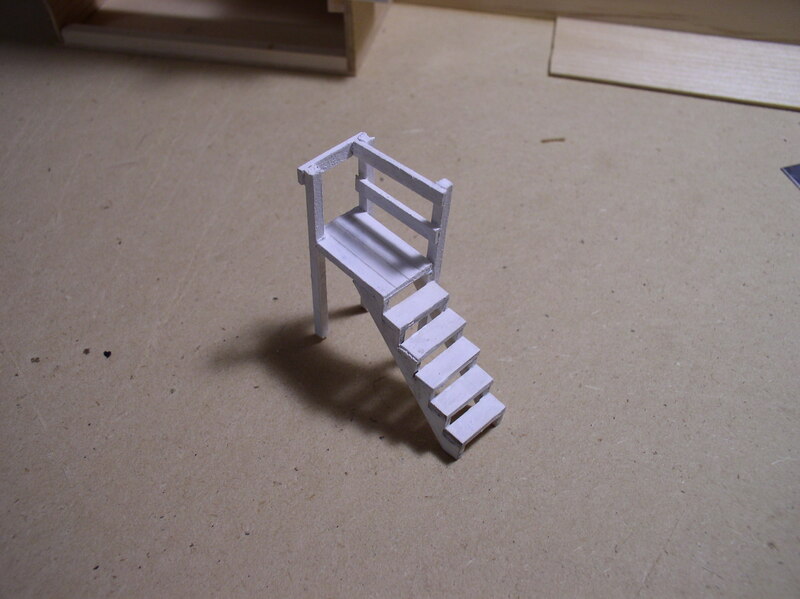 The small stairway has been constructed. What do you see in your prototype photos? Project work has continued from home, away from the railroad itself. Between entertaining escapee New Englanders from the snow and working to get my leg healed, very little time has been spent on the railroad itself. 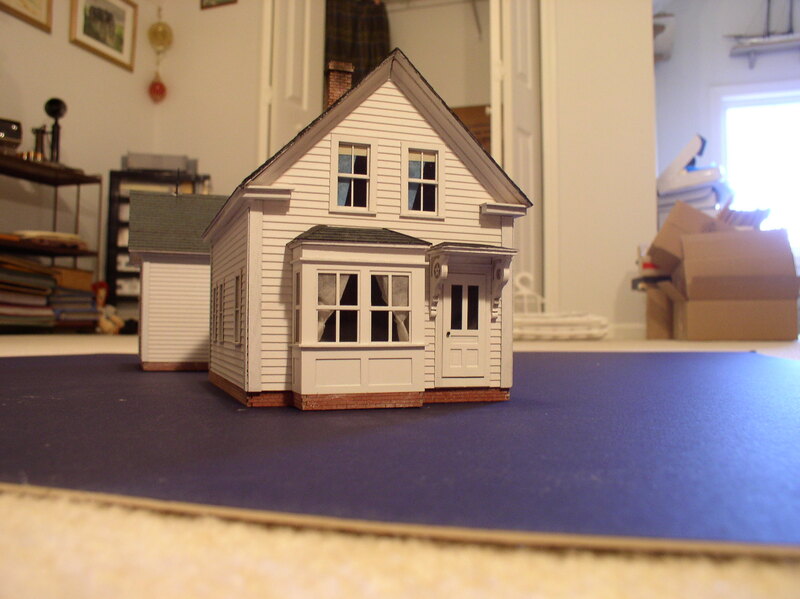 The ‘House on Route 214’ has been completed up to the point of planting into the Ayers Junction scenery. 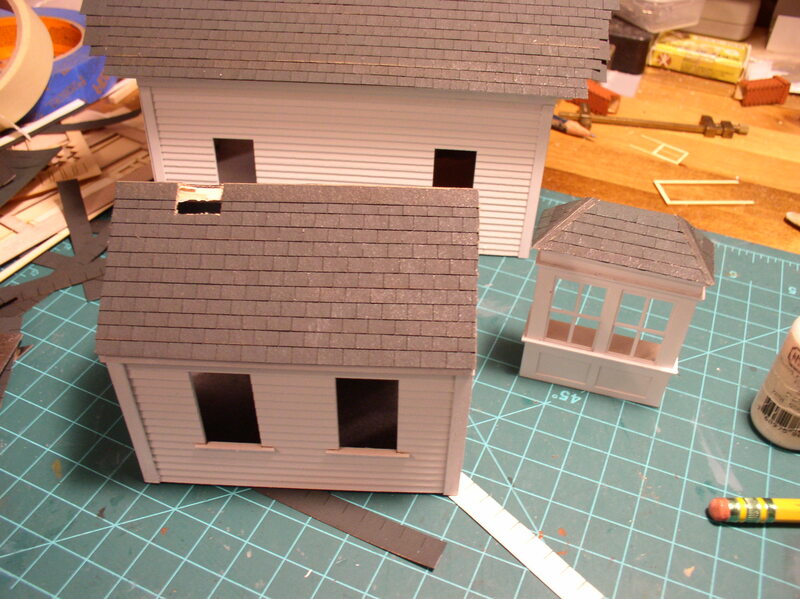 The actual installation must wait for the completion of a curved turnout behind the house location. Here are a few shots of the house, which is a ‘connected Maine home’. I have been delighted with every aspect of this kit by Mount Blue. The parts are quite accurate making assembly trouble free. As you can see, there are three main elements to the home. I chose this arrangement because of the way it needs to fit the available space. 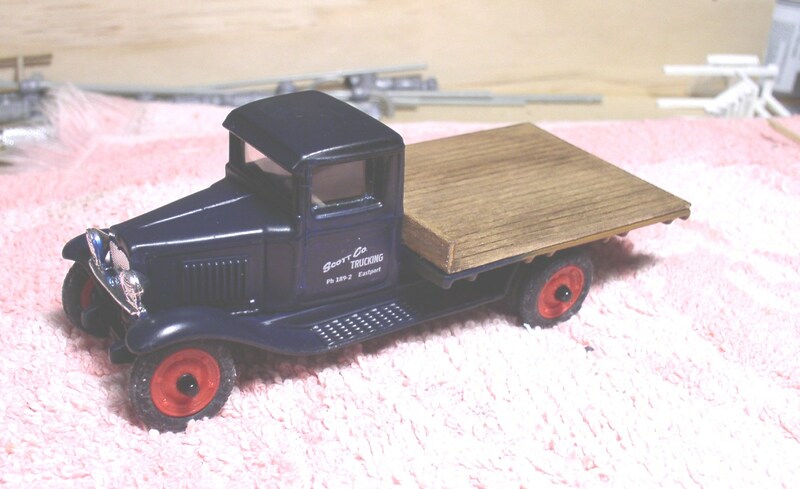 I have been working on several different truck models and will show them when lettered. As part of the local trucking business I have also been building a pair of oil/kerosene vertical storage tanks for Eastport. For a number of years these tanks were a signature part of the Eastport Yard area. The evidence of the RR is totally gone. The tanks were moved after being purchased by Dead River. They were laid horizontally and continue to serve Eastport. Again, I will add photos when completed and lettered. I am currently awaiting the arrival of some custom decals. The only thing happening on the railroad itself has been work on for road crossings of Route 214 in Ayers. Route 214 is a paved country road, but the railroad crossings themselves are timber. Just looking at that makes me anxious to get back to the railroad itself which should be shortly now. 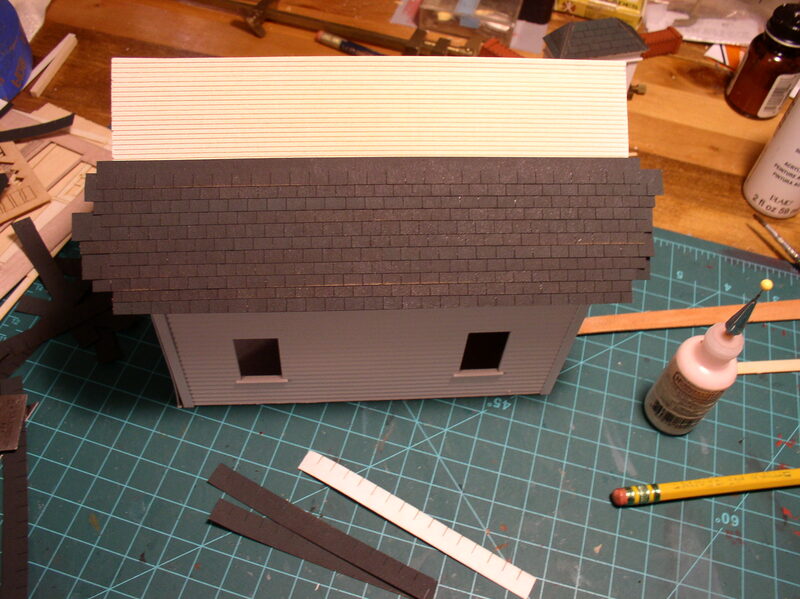 As this month closes out, the shingling of the house and barn are just about complete. I assume that the peel and stick adhesive is good, but I also put down a bead of wood glue ahead of each strip of shingles. I’d rather make sure in the long run. We had a 55 degree day this past week which made the painting of the walls, doors and windows possible. I am now free to move on to the detailing stage. 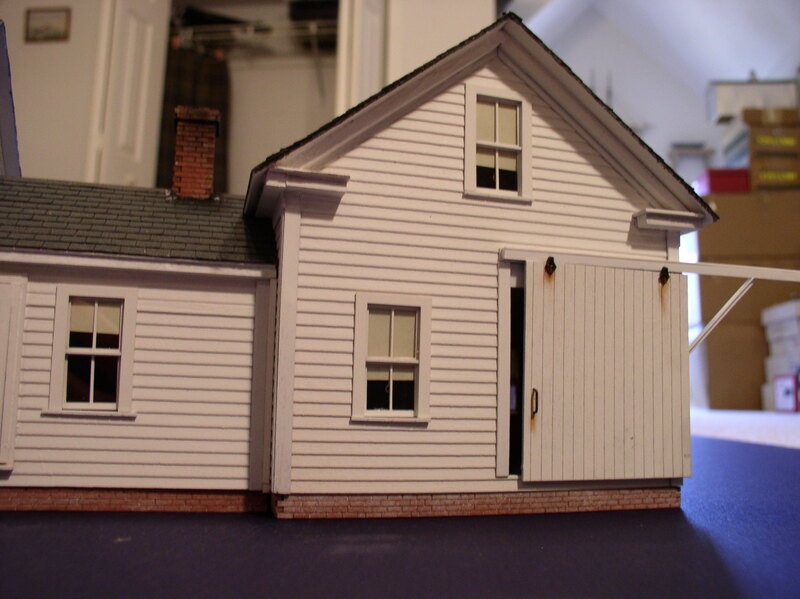 Mostly the time in the last couple of weeks has been spent constructing a wood and maintenance shop next to where the railroad is located. I have needed some tool storage and relocation which is necessary as I move forward with the project overall. I did get a bit of time on the railroad itself starting to prep the area where the house will be located along Rt.214. There are four tracks that make up Ayers Junction and I have added planked road crossings to three of them thus far. Last year at a small local RR show, I found a sleeper cab tractor trailer. The trailer itself was not useable, but the cab unit had possibilities once the sleeper cab was removed. I made a heavy logging track out of it by adding a frame and log supports. It is coming together nicely enough that I can show it. It is pretty much what I wanted, except for those horns on the cab roof which will be changed. The truck is really just a prop for the logging spur in Calais. It will help to illustrate what the spur is used for. This month I also acquired the third Lindberg shrimp boat kit. I really like the potential of these boat models in a limited space harbor that I have. 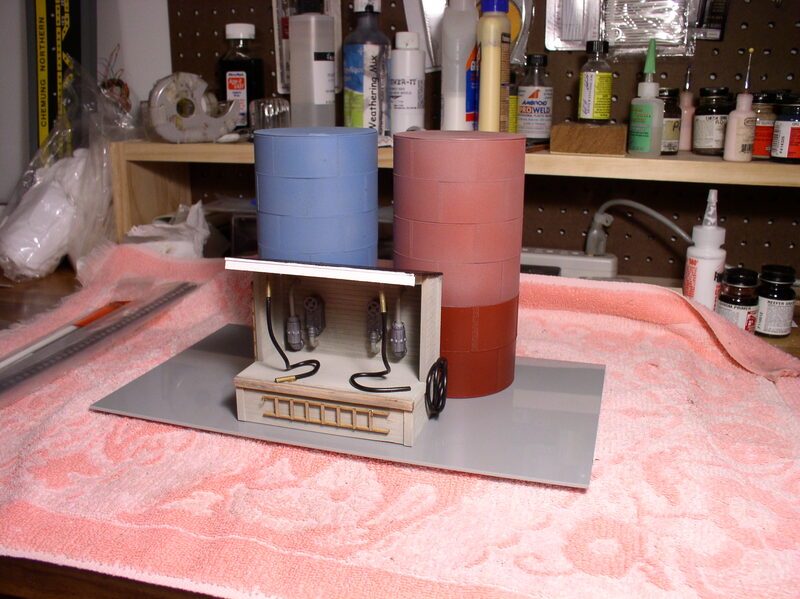 They are 3/16 scale which is helpful in compressing without distortion. By cutting the hulls at the water line and adding 1/4″ details they become nice compact vessels. 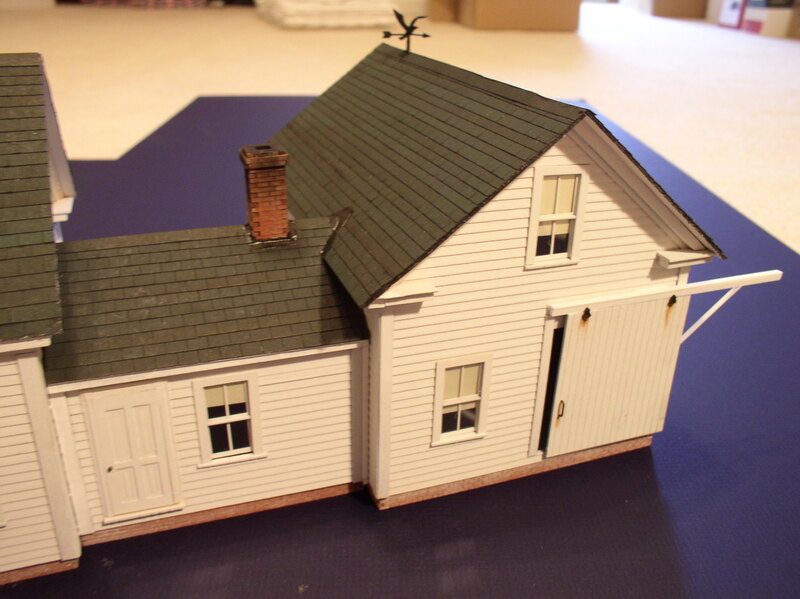 I have one from my last railroad which was converted into a typical New England dragger. Then when I started building Eastport, I knew I would need a sardine carrier of the same length. I also realized recently I would need and open deck freighter, hence the third. The carrier has its stern tucked in and the freighter will need widening. 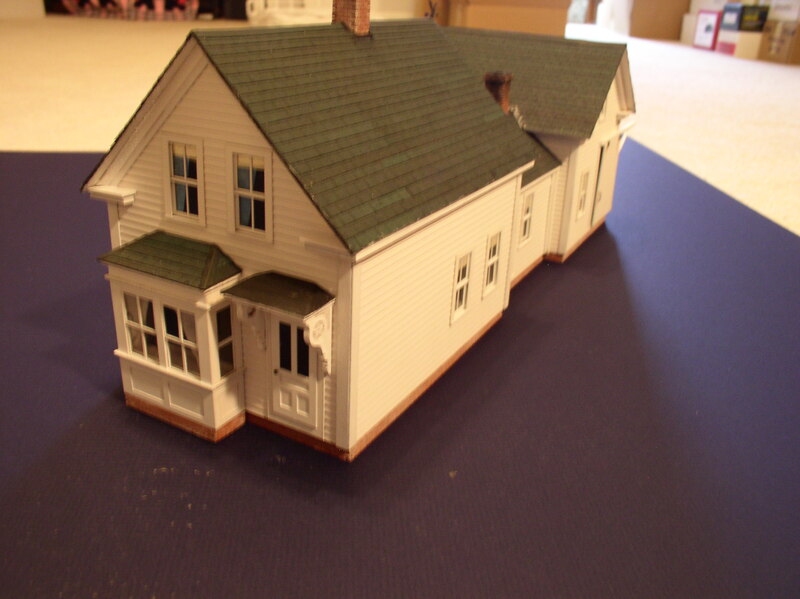 Having grown up on the New England coast where the rails met the sea, this is one of the reasons Eastport was chosen as a model. Shown in the photo is the dragger version. 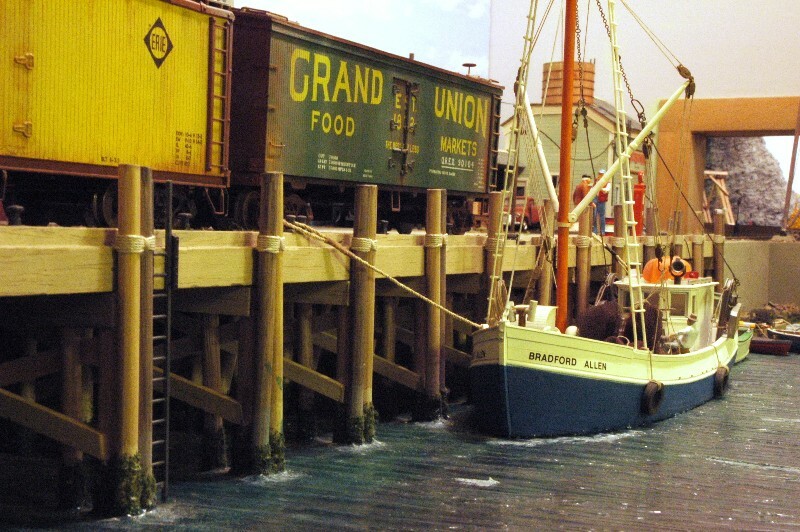 Boats make a great diversion from rolling stock modeling. Already my planned harbor is way to small. I will just have to rotate as they come and go doing their chores.